My first car was a 1978 Chevy Malibu Classic; a rear-drive, V8 sedan with an 8-track tape player and a headliner held up by push pins. But in car years, that was 5 generations ago. So this week I’ve got the all-new 2016 Malibu; a midsize looking to make inroads with the segment leaders. Apparently, size does matter when it comes to family cars. GM learned that lesson the hard way with the previous Malibu where cramped rear seats kept customers away. Obviously, that shortcoming has been addressed here with a longer wheelbase that affords an extra inch + of legroom while the big trunk remains virtually unchanged. Other notable upgrades include a significant drop in weight, a new 8-speed automatic transmission contributing to a 2mpg bump in fuel economy and a bevy of new safety tech and top-notch connectivity. By-in-large, my week with this range-topping Malibu has not lived up to the hype GM trumpeted when it was revealed at last year’s NY Auto Show. My initial impression of this new front grille has not changed since then. To me, it sullies an otherwise attractive design borrowed heavily from the larger Impala. And in 2016, no car that wears a Premier badge should ever use halogen headlamps. Optioned up to $34,285, this Malibu runs standard with the high-output 2.0-liter turbo-4 as does the 2LT trim just below it. 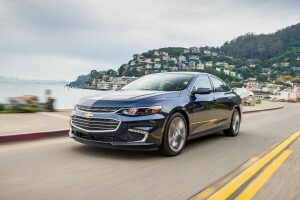 The 3 lesser trims – the L, LS and 1LT – are powered by the new 1.5-liter turbo and these are the Malibu models to shop if 30mpg is of importance. Those who want V6-level performance will turn here to this 250-horsepower motor instead which is impressively refined and robust with a quick acting 258 pound-feet of torque. Regular gas is OK but premium is recommended, rated at 26mpg in combined driving which is exactly where I’ve finished. The Malibu’s interior is a mix of hits and misses. Per usual GM, the technology is fantastic with Chevy MyLink full of all kinds of useful, easy to use features including OnStar, Apple CarPlay and teen driver settings. But the touch points have a less than credible rental car feel, the colors are drab and the rear seat bottoms are short. Here’s where the Malibu shines. They’re crushing the technology angle. The new Teen Driver feature is the first in the industry with a built-in component that lets parents view on a display how their teenager drove the vehicle. To the delight of occupants, there are 2 USB ports in the front and 2 more in the rear plus a standard outlet. MyLink, OnStar and CarPlay are a beautiful trifecta of ultra-helpful, intuitive connectivity features, and the driver information display brings much of that intelligence to the gauge cluster with easy configuration. And who doesn’t love the 4G Wi-Fi hotspot? Combined with welcome touches such as remote start, auto highbeams, adaptive cruise control with automatic braking and the full pantry of camera systems such as pedestrian alert with automatic last-second braking, forward collision alert with automatic braking, lane keep assist and a parallel and perpendicular parking assistant the Malibu will wow you with its up-to-date, forward thinking IT. The 2.0 liter turbo won’t have you longing for the old V6…its fittingly strong and reactive whenever you need more power. The 8-speed is mostly smooth though going from reverse to drive often causes some abruptness. And there’s a lot of Buick in its ride…quiet and smooth. But the handling is clumsy even for this segment and at the end of the day it’s hard to imagine going Malibu over Accord. And that’s the crux of the Malibu’s lot in life; it’s improved in some key areas and goes all-in on safety tech yet lacks the premium polish and honed drivability to knockout the segment’s heavy hitters. Also offered as a 46mpg full hybrid, the 2016 Malibu starts at $22,500.